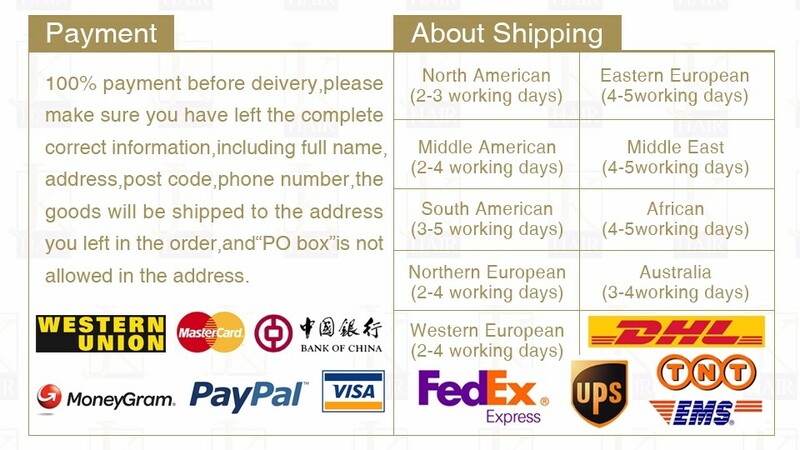 8"-30" Inch 8A Top Grade Remy Loose Wave Human Hair Extensions,Double Wefts,No Tangle,No Shedding,Fast Shipping. Beautiful texture, Fashion Hair Style, Super Soft, The Texture Could Be Hold Well After Washing. (5) Double Drawn Strong Machine Weft , Prevent Shedding. 4-7 working Days to Africa Countries. Q: How Much Hair Do I Need For a Full Head? A: Usually 3 Bundles with 1 Lace Closure Can Make for a Full Head. Q: Can the Hair Be Dyed? A: Natural Color Can Be Dyed or Lightened. We Highly Recommend a Color Preview Test on a Swatch of Hair to See How Your New Color Will Look. A: It Depends on How You Maintain It. Treat it Like Your Own Hair and Take Very Good Care of It,and Then Normally It Could Last Longer Than 6 Month. Q: How to Measure the Length? A: Please Strech the Hair to be Straight State When You Measure It. Q: How Can I Distinguish the Human Hair from Synthetic Hair? A: To Do Burning Test. Human Hair Burn Out Quilkly and Become Ashes. Synthetic Hair Become a Twisted Ball with a Plastic Smell. Usually 2 packages of Sassina hair can make a normal size head,3 packages can make a full hairstyle. Sassina Hair is cut from young and heathy women,100% real human hair can be straightened and curled just like your own hair,if you are chasing an amazing hair style,we suggest you can let your hair dresser to make it for you. The hair can be dyed into darker color. 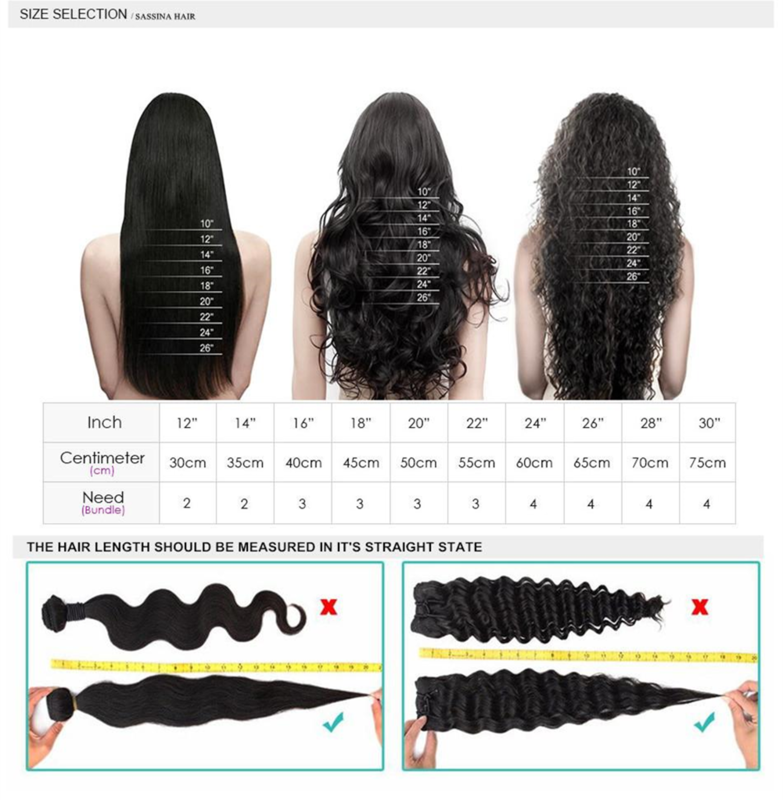 Please choose a strand hair to have a test before dyeing all the hair. But in usually time we do not suggest to do so as it will damage the lifetime of the hair. Use sulfate-free and moisturizing formula shampoo. The more that a shampoo moisturizes,the better it will be for your hair. Please deal with your wet hair cautiously. I suggest you could not sleep on your moist hair,as it can certainly harm your extensions by splitting them and also endanger your health. The Satisfaction Of Every Customer Is What We Are Chasing For,Thank You For Your Trust ! Free shipping on all orders over $9. We are here all the time.